We have rotten tomatoes. The ends of around a quarter of the crop are circles of brown mush. Research tells us this is blossom end rot and basically our own fault. Tomatoes are time-senstive and high-maitenance and if you fail to water them at the allotted time EVERY DAY they have a hissy fit and send their rear ends black. Something to do with the ability of calcium to reach the vine if water-supply varies. We trim off the lower leaves and remove the worst affected specimens – no point the plant putting its energies into ripening something that I will chuck in the compost. The rest of the crop looks healthy. In a month’s time I confidently predict that we will be drowning in passata. 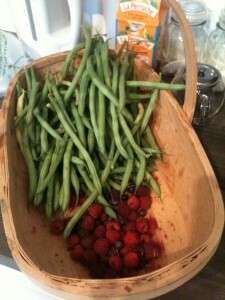 In other news, we have a first crop of stick beans! And it’s a good one! Have already siphoned some off to give to friendly work colleagues. 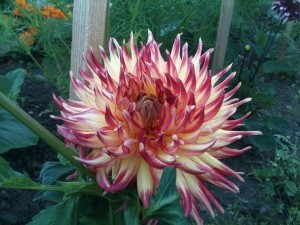 Dahlias are all out and proud and camp as you like, and the autumn squash are threatening to take over. The love-in-the-mist and cosmos as finally doing their thing. 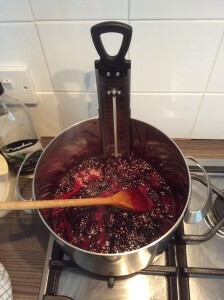 Made the blackcurrant jam. Is OK but slightly too thick, remember next time – more water.